ST. GEORGE – The criminal charges continue to pile on for a St. George couple accused of committing a wide-variety of theft-related crimes in Mesquite, Nevada, and the Washington County area over the last several months. 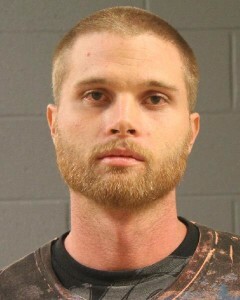 On Nov. 25, a St. George man reported his truck had been stolen after his son saw the truck being driven by 28-year-old Bryce McDonald Smyer on southbound Interstate 15 with Dacota Dawn Dacus, 27, and another occupant inside, according to a probable cause statement filed by the St. George Police Department in support of the arrests. Later that day, Smyer, Dacus and Justin Leroy Hustead, 36, all of St. George, were each arrested in Mesquite, Nevada, on multiple felony charges after officers responded to a Wells Fargo Bank in Mesquite to investigate three people suspected of trying to cash stolen checks, including a $3,000 check they had allegedly stolen from the truck’s owner. “It was determined the suspects had obtained multiple checks from various persons as well as a business, and were traveling around the city of Mesquite attempting to cash the checks,” the Mesquite Police Department said in a media statement issued earlier this month. On Dec. 23, a relative of Smyer’s drove him to Mesquite to talk with an officer about charges he is dealing with there. When the relative returned home, she noticed money had been stolen from her purse, according to the probable cause statement. She reported the theft to police. When police ran Smyer’s information through a database, they learned he had four active warrants for his arrest, including a $10,000, $3,070 and $680 cash-only warrant, along with a $25,000 warrant. Officer’s responded to Smyer’s residence to speak with him on Dec. 24. Dacus initially told police she hadn’t seen Smyer in weeks and that he wasn’t home. She later confirmed he was in the house. When Smyer saw police, he tried to flee on foot. He ran through a backyard and jumped over a fence before being stopped by a gate, the report stated. Police drew their Taser when Smyer failed to comply with orders to stop and get on the ground. After some time, Smyer got on the ground and he was handcuffed and taken into custody. When questioned, the statement read, Smyer denied taking the money from the relative and said he had not seen her the day prior and that she had not taken him to Mesquite. “Bryce’s story changed multiple times,” the officer wrote in the statement. “He later said he found it in his nine year old son’s backpack and took it so it would not get lost,” the officer wrote. When police contacted the 16-year-old girl, she told them her vehicle was broken into about four weeks prior, the statement read. The girl said her car radio was broken during the vehicle burglary because the person who stole her wallet attempted to steal the stereo, too. When police questioned Smyer about the vehicle burglary, according to the report, he maintained that his 9-year-old son had the driver’s license and he had nothing to do with it. Smyer was booked into the Washington County Purgatory Correctional Facility. He was charged with two second-degree felonies for burglary of a dwelling and theft; two class A misdemeanor’s for vehicle burglary and failing to stop at the command of law enforcement; and five class B misdemeanors for theft, criminal mischief and interfering with arrest. Smyer made his initial court appearance Monday in 5th District Court. St. George Police filed charges Monday against Dacus for her involvement in the stolen truck incident. She was charged with two second-degree felonies for burglary of a dwelling and theft, along with two class B misdemeanors for theft and criminal mischief. According to booking information, both Smyer and Dacus remain in custody at the time of this publication. Hey “….”, are you a mentally handicapped adult or a 10-12 yr old little child? Hey STUPID ! The only mentally handicap here is you STUPID ! and you’re 3 year old mental status STUPID. nice try STUPID ! have a nice day STUPID ! little kids all have internet access these days,,, what can ya do? It’s not nice to call STUPID a jerk and a loser. but STUPID is a jerk and loser. I think you might be on to something there! I can just see a 40 year old man in his moms basement commenting back and forth to himself and eventually beating himself up like Jim Carrey on Liar, Liar! Whatever the case, I wish these two (or more likely, one) would get a job and move on with their life so we can have some semi intelligent, semi relevant comments to read and respond too. Smyer sounds like a total loser. Let’s hope he stays in jail for a while so other people’s property is safe. Why are these people always on the sheriffs website. put them away for a long time or get them the hell out of here!